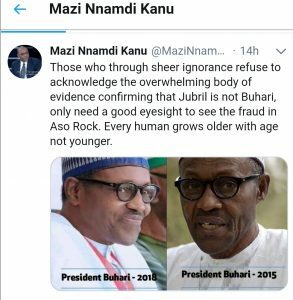 The self-acclaimed leader of the Indigenous People of Biafra (IPOB), Nnamdi Kanu, has said that he his in possession of an “overwelming evidence” to prove that President Muhammadu Buhari was cloned. Speaking late Tuesday, the pro-biafra activist lambasted the Presidency over alleged fraud. In the new image, he compares the ‘real’ Buhari and alleged cloned one. He had on Sunday uploaded what could be tagged as a pictorial evidence to sbow that Buhari was cloned.